Yesterday I received a call from a client, a contractor, reporting that one of his employees fell off a ladder and broke his elbow on the job on Monday afternoon. As the employer, he did the right thing in seeking immediate medical care for the employee at the nearest medical facility. He obtained as much information as he could about the injury and supporting info from the employee’s personnel file including name, address, phone, DOB, SS#, date of hire, and wage info. We called in the claim this morning to the carrier and a claim adjuster is now working with our insured to guide him and the employee through the treatment process. Statistics show that falls from ladders injure over 20,000 workers annually. Some injuries result in permanent disabilities and even fatalities. If you’re working in a job capacity that calls for ladder use, be sure to make ladder safety a high priority for your employees. By following these safety guidelines, you can help prevent ladder accidents. Safety starts before the ladder is even mounted. Before using any ladder, check its condition. Make sure there are no broken, cracked, or missing rails and that rungs are not slippery from grease or oil. Check for damage or corrosion on metal ladders. If a ladder is in poor condition, don’t use it. Report the problem so it can be tagged and repaired. A competent person should periodically inspect all ladders and remove damaged ladders from use until they are repaired. Choose the appropriate type and size ladder for the job, including correct fittings, and safety feet. 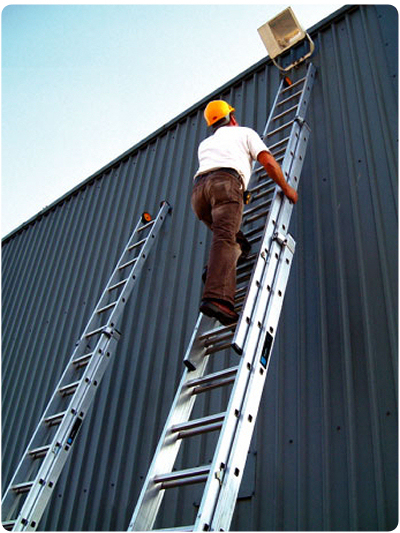 Near electrical conductors or equipment, use only ladders with non-conductive side rails. Set the ladder on solid footing, against a solid support. Place the base of a straight ladder out away from the wall or edge of the upper level about one foot for every four feet of vertical height. Be sure straight ladders are long enough so that the side rails extend above the top support point by at least 36 inches. Single cleat job-made ladders should be 15 to 20 inches wide with ladder cleats uniformly spaced 12 inches apart. Never try to increase the height of a ladder by standing it on other objects, such boxes or barrels, or by splicing two ladders together. Portable ladders should be tied, blocked or otherwise secured against movement. Keep ladders away from doorways or walkways, unless they can be protected by barriers. Keep the area around the top and base of the ladder clear. Don’t run hoses, extension cords, or ropes on a ladder; these may create obstructions. To avoid slipping on a ladder, check your shoes for oil, grease, or mud and wipe it off before climbing. Climb the ladder carefully, facing it and using both hands. Use a tool belt or hand line to carry materials. Most ladders are designed to hold only one person at a time. Two persons may cause the ladder to fail or be thrown off-balance. Don’t lean out to the side when you’re on a ladder. If something is out of reach, get down and move the ladder. Ladders should never be used sideways as platforms, runways or scaffolds. Choosing and using ladders wisely is a step in the right direction.